I would not consider myself a mixologist but I do enjoy the occasional adult beverage. Whether it is in an aluminum can or it is finely crafted with aged liquors and muddled with exotic fruits, I will drink it. I originally went through a cocktail making phase when I was really into Mad Men but who hasn’t done that? And up until recently I referred to my bar book when I needed a decent receipe for a mixed drink. I now have a better option — Minibar for the iPhone. 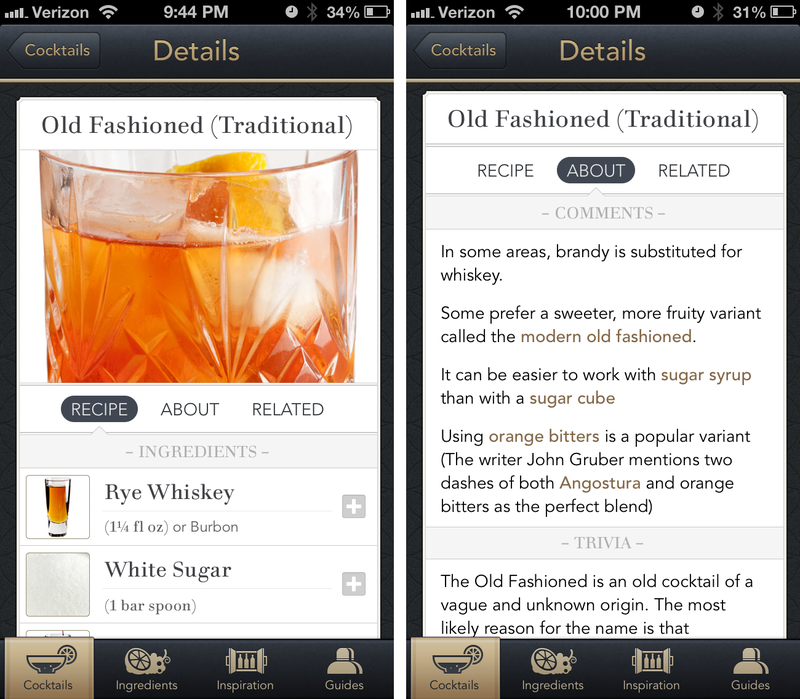 Minibar is a drop-dead gorgeous app with over a hundred cocktails — all of which have exquisite photography, comments, and trivia to truly immerse you in the experience of mixing cocktails. What initially attracted me to the app was the extremely polished and elegant UI: the theme is undeniably well suited for the content of the app. The structure is based on the now standard sliding panel design with a custom tab bar across the bottom. As I navigated through the app I kept finding little details that impressed me. For instance, as you add ingredients that you have at home, the minibar icon in the app's tab bar opens and closes to indicate that you have “added” an item to your minibar. In addition to the ability to track what supplies you have at home, the app can also suggest what supplies you should pick up from the store to complete a recipe, which they have labeled as Inspiration. 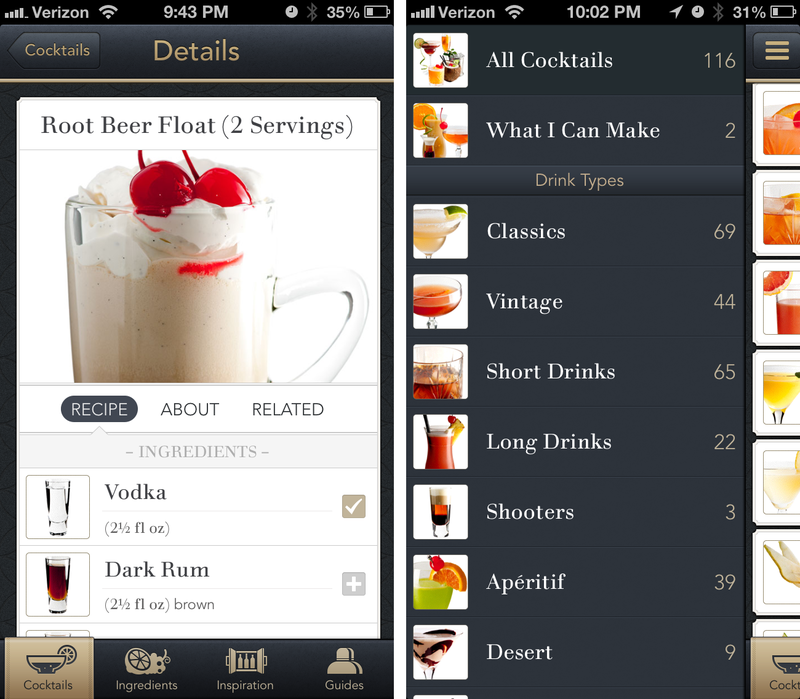 Part of Minibar’s charm is not only the 5-star recipes it consists of but also the fun trivia about each drink. Where my aforementioned bar book gave me a boring story about the Old Fashioned’s origins in the 1800’s, Minibar informed me of how John Gruber mixes his whiskey. The writer John Gruber mentions two dashes of both Angostura and orange bitters as the perfect blend. It is the little touches like this that make Minibar a pleasure to use. So what was the first drink I made with Minibar? 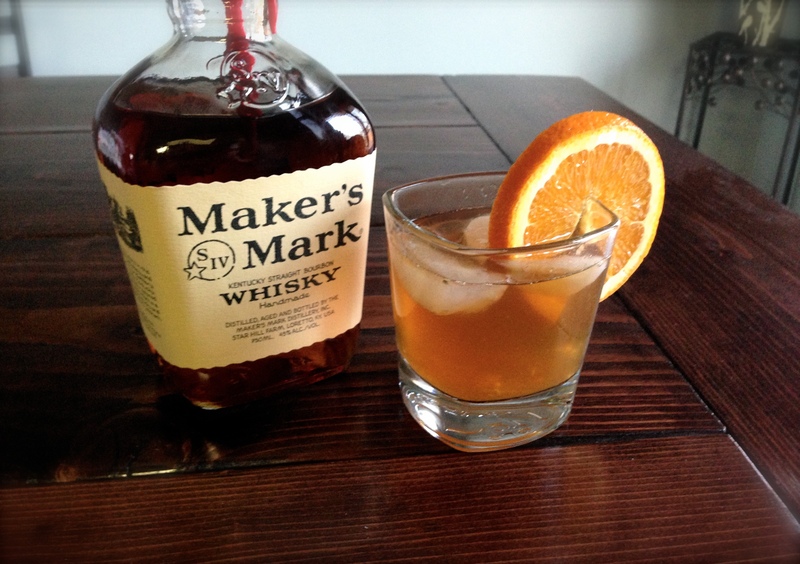 An Old Fashioned, and it was delicious. Minibar is not the first of its kind but it definitely does stand out from the pack with its sharp UI and excellent recipes. 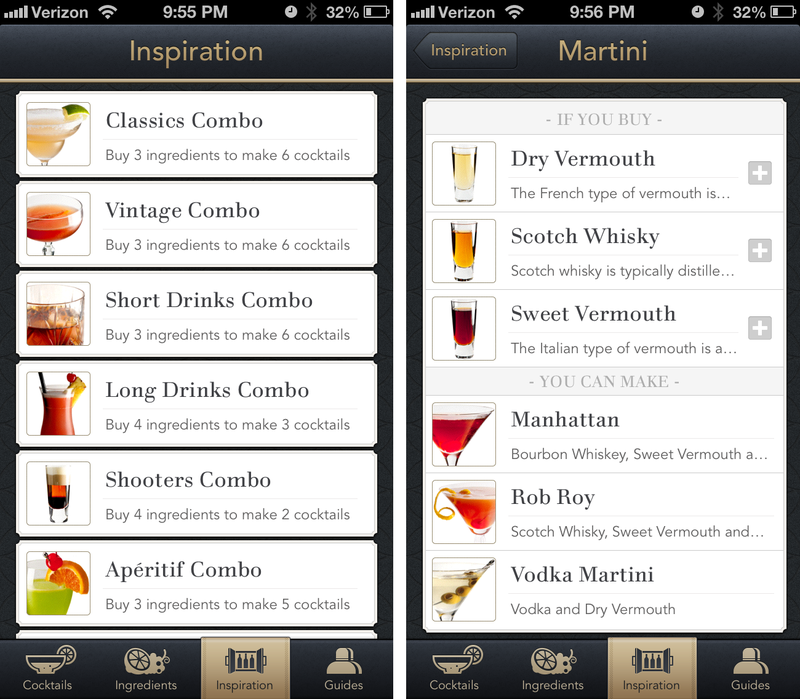 Minibar is available for the iPhone at an introductory price of $2.99.